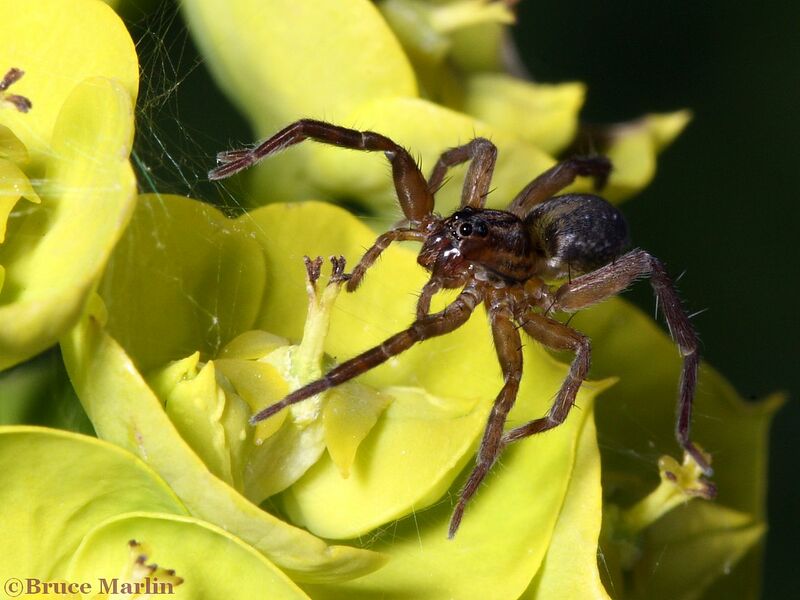 Pirate Wolf Spider – Pirata sp. 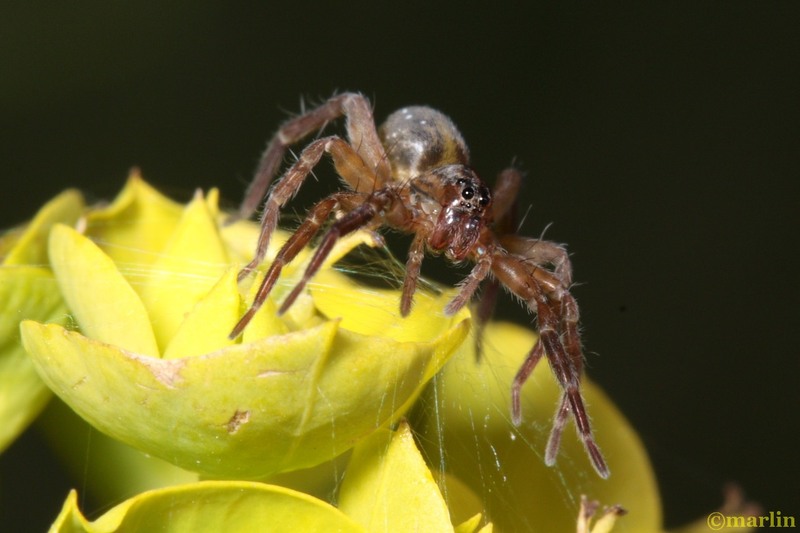 This small (5mm) wolf spider was constructing a sort of scaffolding web encasing several flowers, upon which she can rapidly attack any prey that happen to blunder into range. She also had zip lines to other plants nearby – she had the whole neighborhood rigged! It may look like she’s floating in midair, but she’s standing on that web. I’ve seen orbweavers build the same kind of disorganized looking web strictly for moving around their environs easily and quickly – increasing the space they can hunt. Wolf spiders are members of the family Lycosidae, from the Greek word lycosa meaning wolf. Although they don’t run in packs, their method of hunting is to run down prey just like their large mammalian namesake. They are robust and agile hunters that rely on good eyesight. 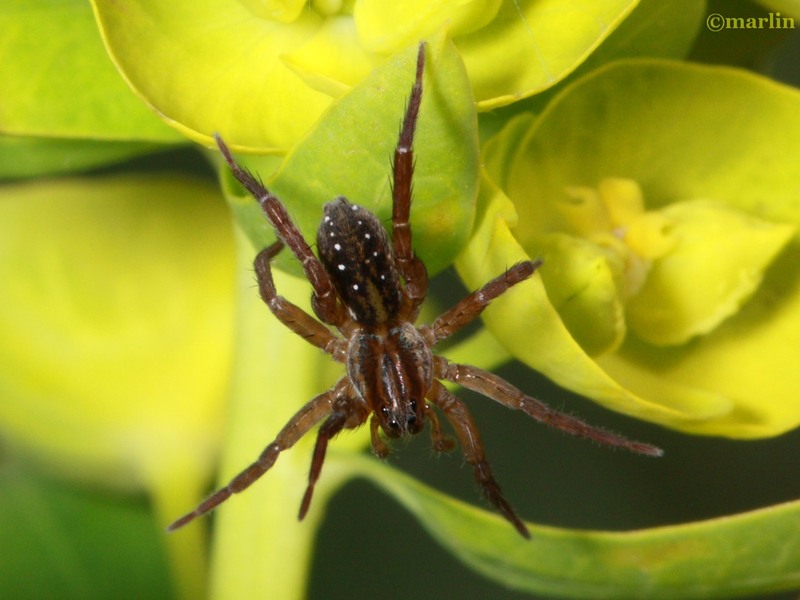 There are over 200 species of Lycosidae in North America, ranging in size from 3 – 35mm. They have eight eyes arranged in three rows. The bottom row consists of four small eyes, the middle row has two very large eyes, (which distinguishes them from the Pisauridae) and the top row has two medium-sized eyes that face the side. Wolf spider females carry their eggs along with them in a round silken globe, or egg sac, which they attach to the spinnerets at the end of their abdomen. 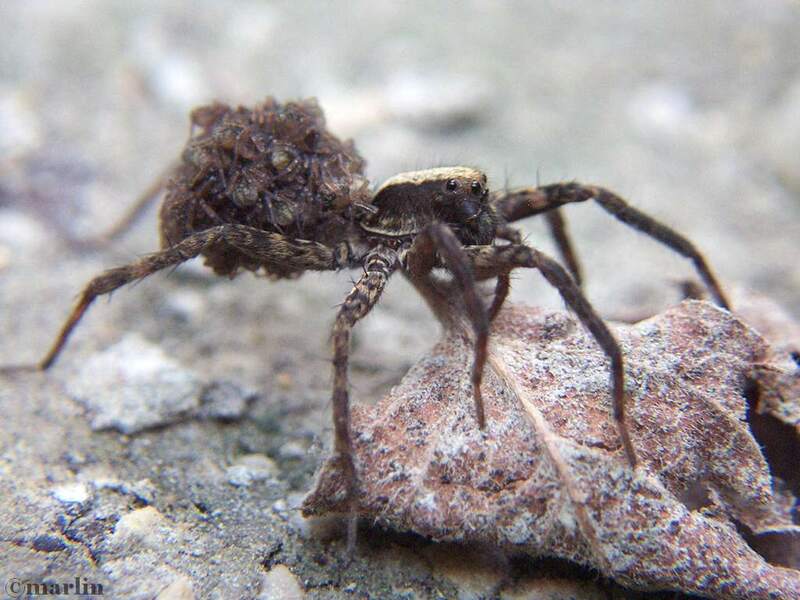 The abdomen is held in a raised position to keep the egg case from dragging on the ground, and they are still capable of hunting while so encumbered.Also unusual among spiders is their method of hatchling care: after the eggs hatch and emerge from the protective silken case, the new spiders climb up their mother’s legs and crowd onto her abdomen. She may carry them around for several hours or days until they are ready to fend for themselves. It must be noted, however, that the hatchlings will scatter immediately if the mother spider is threatened or attacked. 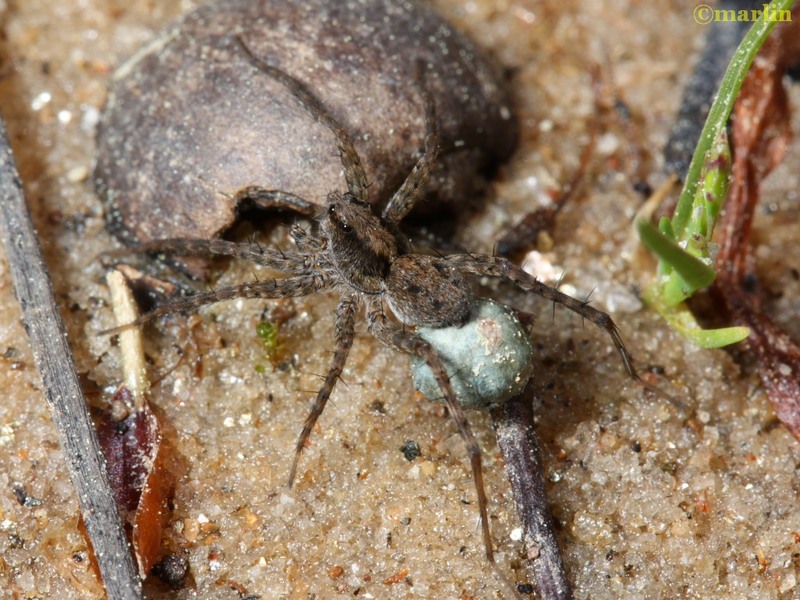 Wolf spider with egg sac (above) and one with hatchlings crowded onto her abdomen (below).